The first time I learned about Mike Scott was when I saw the Goldfish animated music videos. The style was different than what I normally experienced and the script of the animation was always classic or extremely far out (which I loved). That’s why when I went to go watch his work on youtube for the millionth time ( I basically have most of his videos on loop) I took the chance of contacting Mike. Yeah, my first official quote, thanks Mike! So without further dawdling I present to you one of our favorite animators in the animation industry, Mike Scott. Hi Mike! Let’s start with you telling us a bit about yourself? Where did you study Animation? How did you start animating music videos for Goldfish? Tell us more about the Kiffness and your animation music videos for them? Tell us about the Anime Studio Software you’re using? What kind of equipment do you use when creating your animations? How do you kickstart your creativity? If you could be any character in adventure time, who would it be? Your top 3 favorite music videos you created? Who inspires you and what project would you have loved to work on? Tell us a bit about Happy Land? Any new projects you’re working on, any major ones in the future? Any tips and advice for aspiring animators out there? I’m a dude, 31, I used to live in Joburg, now I live in Plettenberg Bay, sometimes I stay in Cape Town with my brother for work stuff. I used to play drums in his band ‘The Kiffness’ (we started it together) and now he’s got so many gigs that I decided to carry on with animation. I like Plett’s beaches – bit of surfing, chillaxing. I’ve got a thing for pixel graphics and I have zero kids. I started doing animation tests during junior school with my dad’s video camera. Then one of my brother’s friends’ moms helped me with a stop-motion short. I tried some tests at high-school and a buddy that was into film helped me make another stop-motion short. In Joburg I figured out a way to make Photoshop GIFs and import them into Premiere (not a particularly good workflow) and a comedian and I made a pilot called ‘Jozi Zoo’ that was later turned into a somewhat watered-down kids show. The pilot we made was awesome, with a drag-queen body-building lion, a bush-baby that had taken something the night before and he was dying in the heat with massive bloodshot eyes, an endangered White Rhino, a wheeler-dealer Indian meerkat wanting to pawn off an albino snake … ahhh. Anyways, I applied for this UNESCO 5-week animation course and got accepted, there we had some lectures in animation and script-writing and I got to meet other animators from Africa. I got a job at Red Pepper in Joburg animating kids shows (I think Cool Catz is still playing on eTV), then in 2006 I went to San Diego to attend ComiCon and saw the pilot for ‘Adventure Time’ and briefly met its creator Pendleton Ward … and that changed everything. I used to have a webcomic called ‘Bru & Boegie’ that I updated fairly frequently. Well, I started studying Fine Arts at Rhodes University. I had an awesome party the first year but the course wasn’t really pushing my buttons. I left Rhodes and studied a business degree at Bond University in Joburg and did really well in that. I then realised how boring business is, during this time I was doing cartoons for quite a few magazines – PC Format, Medical Chronicle, a plumbing magazine I can’t quite remember, as well as odd freelance jobs. I got a call from a girl I went to Rhodes with who was working with a comedian and that was my first kind of official animation job in the deep end. Later I took part in this course run at NEMISA where animation lecturers from Algonquin College in Canada came to teach some students during a 9-week course. That was pretty interesting. I was also working as an intern / coffee maker at a studio called ‘Art Attack’ in Joburg where Jozi Zoo was being made. Sooner or later I started getting whole 5/6 minute episodes to animate, and was doing these every 2 weeks. It was a ridiculous amount of work to do for someone starting out but I guess I cut my teeth on these episodes, I made around 15 or 16 episodes I think, besides the others I had helped out with. The quality wasn’t that great but they had their moments. I got a book called ‘The Animator’s Survival Kit’ by Richard Williams and learned quite a bit from that. A German animator I met online showed me something cool with placing keyframes and a penny dropped for how ‘easing-in’ and ‘easing-out’ worked. I made my own show called ‘HappyLand’ (that I sold recently) and I learned a lot from that. And I learned a lot on the job from making Goldfish videos. So, I skipped out on a lot of official animation education and got in through the back-door, but I was keen and eager and worked my nuts off, so I think that counts for something. I moved to Plett and worked on HappyLand. I kind of quit nearly all the regular jobs I had to focus on making this pilot. Time went by, HappyLand wasn’t getting funding, and I took a job as a runner / delivery boy / coffee maker / dish-washer at the Art Department for a company that were filming some scenes of a series called ‘Crusoe’ in Plett. It was fairly intense work. I was getting back pretty late in the evenings, exhausted. I was listening to the Goldfish ‘Perceptions of Pacha’ album a lot in the car and because there was quite a bit of driving involved (the company was based pretty far out of Plett and the various people working on the series were scattered, some in a hotel, some in the forest, some in an old farm yard. It was actually kind of exciting.) I got to listen to the album a lot and it was a little escape. One night I put a walk animation test together, a fish walking to the song ‘Soundtracks and Comebacks’, one of my favourite Goldfish songs. 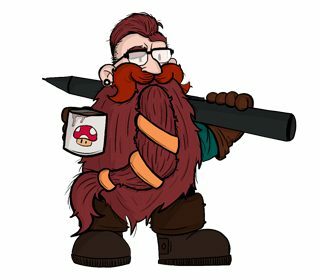 I drew up a couple storyboards and sent it through to Goldfish. It should be noted that I was, and still am, a big Goldfish fan. I’d met them briefly at one of their gigs and had sent them some ‘fan-art’ before. It was in the early hours that I sent through the 8 second animation and I got a reply almost instantly from Dave from Goldfish who said something along the lines of ‘this is cool – where do we go from here?’ I was over the moon. I quoted for a video, Dave showed it to some other Goldfish crew, and I had a job. I was so pleased to not be driving around every day and to be able to work from home and chill with my cat in Plett. So, that’s how it started. Or if you want a full list of his animations go to his animation section : Click here! The Kiffness is my brother’s band, him and I started it 2 or 3 years ago. We’ve both played in various bands separately, one or two cross-overs, and there was a Plett ‘battle of the bands’ so I entered us into it. We didn’t have a name at that time I don’t think, or he may have just decided on a name. We didn’t really have a set, I had some electronic drums and he had some stuff, I think he put a set together, I was playing all the drums at that point, and we won the battle of the bands. So, that was kind of the birth of The Kiffness. He’s since done amazing things, our buddy Shandu who Dave went to school with, has joined on bass and some vocals, Dave has had a number of hits on 5fm and been in the Top 40 for various songs, I used to gig quite a bit with Dave & Shandu but took a bit of strain with wanting to do animation and music. It hasn’t slowed them down in the least. I’ve done a couple music videos, when we were just starting I put a lot of videos together really quickly as we wanted live visuals for the songs at gigs. The latest video for ‘Pushin’ On’ was done by our animation buddy Keegan Thornhill and some of his buddies, I was involved with another project at the time. And, as explained earlier, the video for ‘Where Are You Going?’ did pretty well, better than any of us anticipated. My brother’s pretty creative, he came up with the premise for the Miley Cryus / The Kiffness backup twerker video for ‘Pushin’ On’. Anime Studio started out as Moho. I started using it at the suggestion from a buddy I met at the Unesco training course in Durban in 2005, Unesco bought a copy. It was, back then, made by one guy, Mike Clifton. I stayed up at nights and read through the whole manual until I understood how the program worked. I liked the simplicity of it, the bone-bending was cool and it felt nice to work in. I was pretty active on the LostMarble forums, the official forums for Moho. People posted work, as did I, we discussed Moho and I got familiar with some of the community. It’s also how I met the experienced German animator I mentioned earlier. Moho wanted some user-generated content to distribute with the program and I sent in some of my work. In exchange I asked for a life-time of free Moho updates, which was agreed to. Sooner or later Moho was taken over by Smith-Micro and it became known as ‘Anime Studio’. They liked the Goldfish videos and used it at trade-shows to demonsrate the software, they used my work on box-art and their website and I got familiar with some of the people from there. Every now and then I’d think of a feature and suggest it to them and every now and then it’d be implemented. While there’s more I’d like to discuss but I think an NDA prevents me from doing so, it’s a nice piece of software and I use it for various projects. I use it pretty unconventional ways, I do have Toon Boom Animate and sometimes use that, more for frame-by-frame animation, I like the way Anime Studio interpolates keyframes by default. It uses a unique spacing calculation that I’ve grown to like, there are options to interpolate linearly, or stepped, but the default ‘smooth’ option is sometimes pretty cool. While we’re talking about software – while I was at the NEMISA class this guy from Canada was telling us a story about how he was in a meeting with a South African studio. He asked to see their Maya licenses and they laughed and said they do what all South African companies do – they pirate the software. He got up and left. That story stuck with me and I turfed all my pirated software, music and games (I had a LOT) and went legit. All the software, music and games I have and use are legal and bought, or either legally free. I think it’s a really good thing to do if a person is taking something professionally. 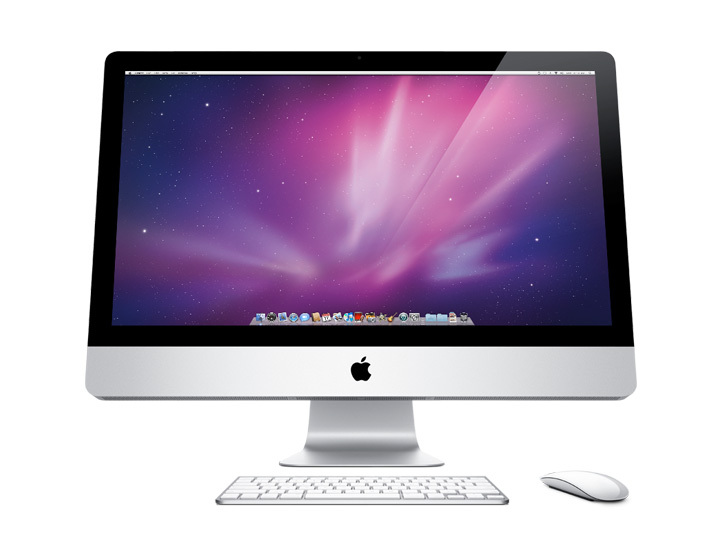 I have a custom-order iMac 27″ (maxed out) that I found on Gumtree when I was looking for a new machine. Almost every time I work on it I’m glad I sprung for it. I can do loads of things at once – use Photoshop while something’s rendering, have a number of resource-intensive apps open at once, it’s whipser quiet where my previous Macbook Pro that was my main machine would get super-hot and its fans would go bananas. I also have a little Macbook that I use for remote stuff sometimes and I hook it up to my Cintiq Intuos 12″. 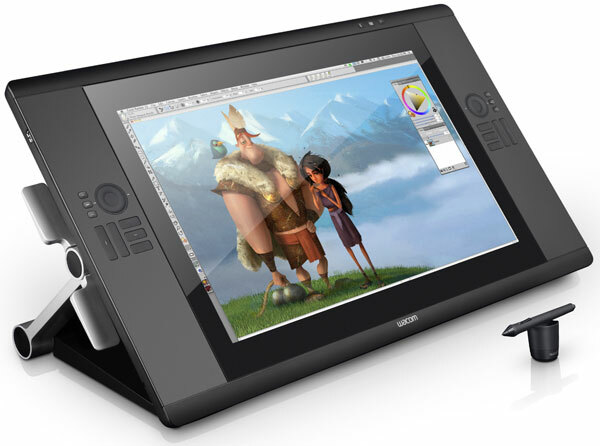 I have a Wacom Intuos 4 linked up to my iMac and work between the Cintiq and Intuos. Firstly though I generally spend quite a bit of time with paper and sketchpads. I get these really great cheap recycled paper sketchpads from a print shop in Plett. They’re either free or cost R2 each. I recently completed a 2 minute pilot (well, a little over 2 minutes). Man there were hundreds of little storyboard cards and pieces of paper. For storyboarding I get a pack of 100 sheets of A4 white card and have it cut into 4 squares – A6, so I have 400 cards to work with. I find the physical rearranging of cards on a table nicer to work with than doing everything digitally up-front in Toon Boom Storyboard Pro. So, I generally stay away from the computer for the initial stages of an animation project and stick with little thumbnail sketches on paper. I also have a really small but incredibly great piece of equipment – two SmudgeGuard gloves. They’re imported from the US, they’re made from a combination of nylon and spandex. It makes a HUGE difference when using the Wacom Cintiq. My hand used to get hot and stick to the Cintiq, with the glove, it’s like butter and way cooler to the touch. I have an SPD-30 drumkit usually set up in my studio, with a KD8 kick pad and double-bass pedals. I used to play in quite a few bands and find jamming drums or making music on Ableton is a nice side-thing to do. I play PS3 during projects if I have it (sometimes my brother borrows it, we’ve played quite a bit of GTA5, we’re playing SSX now). I’ve had a run of one project after another, I may take a break for a bit. I went skiing in France last year (I think it was last year or the year before. I really like skiing, only for 2 weeks though then I’m cold and sad). I do running, I find I get awesome ideas while running but don’t really remember them afterwards. In Plett I spend quite a bit of time at the beach and I have a really good buddy there, him and I chat about loads of stuff, he used to be in advertising in Joburg and we both kind of jam whatever. Mostly though, sitting down with a pencil and paper I find is good. Sometimes it seems like my hand does it’s own thing and I can sometimes zen out and just draw. Ha! I love that show. I was in the conference room when the short was shown at ComiCon in San Diego in 2006. I dig telling this story. Other people were showing their shorts and talking about them, then ‘Adventure Time’ came on. People. Went. Bananas. I was crying afterwards from laughing so much. It was really special. What was even more astounding is the creator, Pen, was so quiet and unassuming, he said something like ‘I just carry this sketchbook around with me, and draw ideas’. I instantly had a hero and emailed him quite a few times after getting back to SA. He had some pointers about my HappyLand show, I mentioned more than once that I hoped Adventure Time became a series. Lo and behold, it did. It actually debuted as part of Nickelodeon’s ‘Random! Cartoons’ program and was (I suppose?) bought or developed by Cartoon Network. I have *just* finished a short pilot for Nickelodeon. Not sure when it’ll be released. Anyways, Pen Ward is one of my heroes. 1. Goldfish – Soudtracks and Comebacks. The first one. There’s something magical about that. I was really just doing my own thing and really flippen’ enjoyed making that. 2. Other Goldfish videos – I have memories surrounding each one, and they’ve been like adverts for me. Some have reached millions of views and I often get requests from others to make music videos. I end up politely bowing out of a lot of jobs, but it’s nice to have the enquiries. 3. The Kiffness – Where Are You Going? My brother and Mathew Gold’s track. We were planning to do a simple lyric video so we can put the song on YouTube. I thought it’d be nice to have some Atari-style 8-bit graphics to go along with the lyrics. It ended up becoming the official video of the song and was #1 on our SA MTV Dance Chart recently, it got nominated for ‘Best Music Video’ by MK, so, that was a bit of a surprise. Pendleton Ward (Adventure Time), Steven Purcell, David O’Reilly, Frederator Studios, Studio AKA, the guys at Triggerfish, Stephen Hillenburg, Hao Miyazaki, Nintendo, Sega, early 16-bit / 8-bit videogames, Joseph Cambell, my brother, Jesus, Bill Watterson, Matt Groening, Richard Scarry, James Jarvis, Moby, Goldfish, St. Germain, Daft Punk, Air, Gorillaz, Paulo Coelho, Mozart, old Lucasarts adventure games, Jereme Perin, Carter Beauford … I’ll likely think of loads more after sending this. Ah, right. I touched on HappyLand earlier. It was a show I created a pilot for. I shopped it around, various agents took it and showed it to TV stations, as did I. In South Africa, coming off the street, the general response a station may give (and I know this as I’ve heard a similar thing from other creators who want to get their creations on TV) is; ‘This is nice. We don’t have any budget. We can show it for free’. That’s an option if the show is an advert for something, but HappyLand isn’t. It just *is*. The idea was for a show to be day-glo like Super Mario Bros, look like a video-game, have not much angst, just friendly, gentle stories. I had the idea while working on Jozi Zoo, the Jozi Zoo characters had black outlines that made them specific to a particular size – too close and the lines looked too big, too small and the lines looked unnaturally thin. More as a style thing, I wanted a show where there are no outlines, just coloured shapes, with vectors we could zoom in and out as much as we wanted and still use the same character rig. The 2 minute pilot I made I think is pretty cool, my brother made the music, I had a buddy record the voices. But, no luck with getting funding to create more. So I decided to make more by myself. I went for a really minimalist look, no backgrounds, just 2 characters, I made the music myself and created 52 short episodes – around 30 seconds to 1 min each. The idea was for these to be used as interstitials, shorts between programs when there aren’t adverts. A station may go for them, kind of like ‘La Linea’ if you remember that show, the one with the single shite line and ‘Badum Badum’, the guy that laughs and complains a lot. Anyways, I spent quite a while on them and called them ‘HappyLand Shorts’. I made some DVDs, together with another show I had made, 7 episodes of ‘BeatBoxing Dave’, printed nice DVD box cases for them and offered them for sale. Quite a few overseas people bought, but still, no sales to stations here, just responses that station x is happy to flight them for free. Last year I went to the Annecy Animation Festival in France. It’s the biggest animation festival in the world. There were 6 of us in a South African delegation, and around 30 South Africans there in total. It was awesome. A buddy suggested I try sell HappyLand while I was there. I had my laptop and at the South African stand I screened HappyLand shorts and had a ‘for sale’ sign written on a piece of paper. I didn’t make a sale there but soon after I got back to South Africa I decided to work up the shorts and give them another layer of polish with hand-drawn backgrounds and get in touch with one of the many contacts I had collected up at Annecy. I’d just started working on HappyLand again when I got a message from someone wanting to buy them all. It was from an ex-South African living in China for 10 years who had followed HappyLand’s development from the beginning when I was posting WIP on the LostMarble forums. I sold him the entire HappyLand IP. Sure, I’ve just finished the Nickelodeon pilot, it was an original idea of mine, I started it in Plett and moved to Cape Town and plugged in with TriggerFish, I worked on it for about 6 months between Cape Town and Plett. I’m super proud of it and I look forward to it being released. With that done, I get quite a few enquiries for music videos and other jobs, I’ve kind of grown a little selective and am generally going with projects that ignite something within me, like something that lights my fires I may be interested in. At the moment I’ve just sent off some previous work to Annecy to be considered for the 2014 festival, and I’m half-planning to start on a music video where animated people / creatures just dance weird dances. I may then find a suitable song after some tests and consider doing a music video for that. But no real biggies at the moment, one or two possibilities. Ha. I often get asked this. I just don’t know. If you really love it, you’ll find a way I guess. There are loads of nay-sayers who say there aren’t any jobs out there, or the industry is dead – if you love it, make your own job. Pro-activity counts for a lot. Thanks for the great interview Mike, all of the best with your business endeavours and keep on inspiring!